It is said that Trebeta, the son of the Assyrian King Ninus, founded Trier as a settlement around 2050 BC, about 1300 years before the origin of Rome. An inscription on the Red House on the Main Market Square (Hauptmarkt) in Trier, just opposite of the DOMSTEIN, attests to this legend. Long before Rome, Trier stood one thousand three hundred years. May it persist and enjoy an eternal peace. Under the name Augusta Treverorum (city of Augustus in the land of the Treverer), the city of Trier was founded by the Romans around 16 BC. It is claiming the title of "oldest city of Germany". Many of the Roman monuments, which are part of the UNESCO World Heritage, are located within close proximity to the DOMSTEIN (see our navigation: TRIER). In the 1970s we were confronted with this historical context. During construction works in the basement under the Domstein’s historic courtyard, we found an upright column which turned out to be the south-western pillar of the Constantine basilica. This column is proof that one of the most monumental Roman palace facilities in the world has been constructed in Trier. This floor has been reconstructed based on excavation findings. 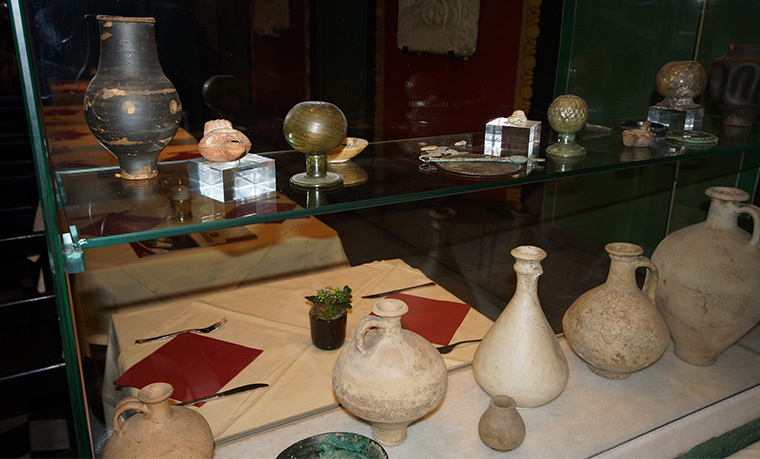 Roman round tiles and hypocausts from the heating system of the palace were incorporated under glass cabinets. 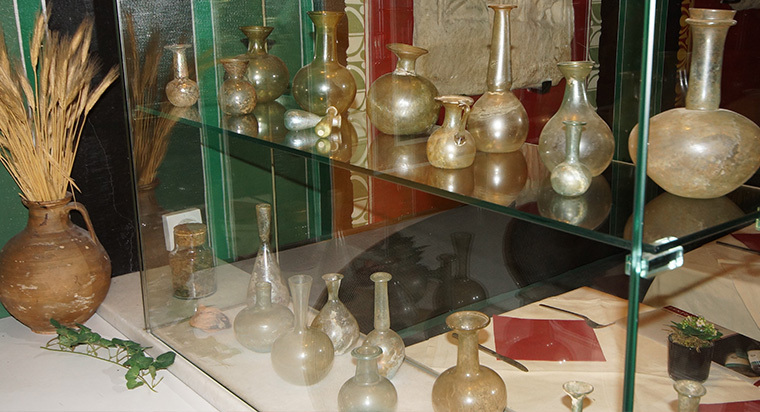 IN THESE GLASS CABINETS you can see one of the best private collection of Roman glass from the Period of 150 to 350 AD. 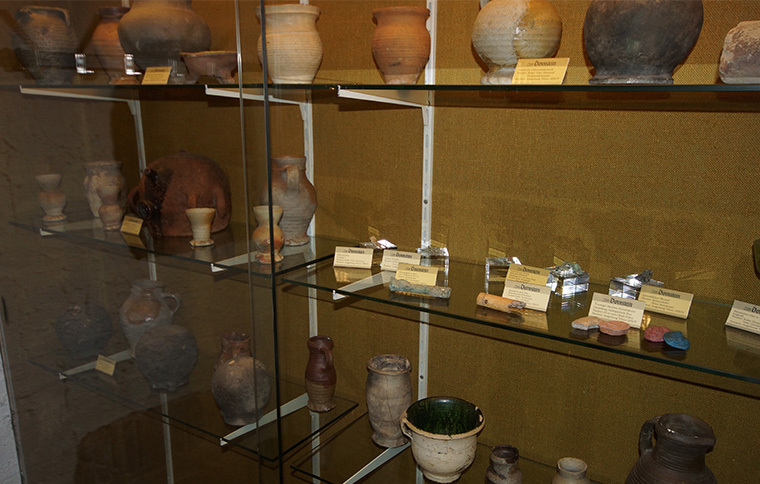 Furthermore, we found a lot of cookware, jugs, food remains in pots, bone fragments, etc. These findings inspired us to have a closer look at the eating habits of the Romans. During our research, we found the Roman cookbook "De re coquinaria". 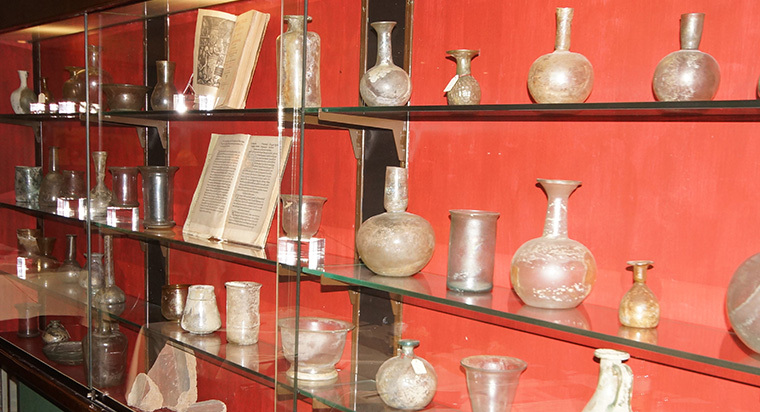 In earlier times, its recipes were attributed solely to Marcus Gavius Apicius. It is believed today that only some recipes were actually created by him. It is more likely that over time several cookbooks and individual recipes, including the one from Marcus Gavius Apicius, were put together by additional authors and copyists. One of the oldest prints of "De re coquinaria" is dated to the year 1500 in Venice - but historically it is not entirely verified. 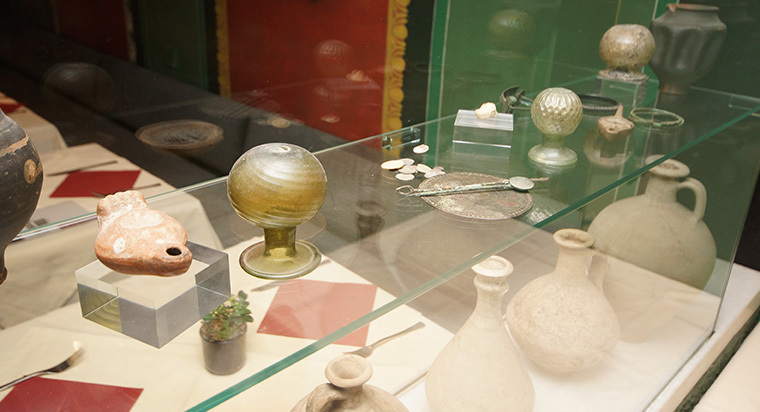 This cookbook can be viewed in one of the glass cabinets in our Römerkeller (Roman cellar). For a long time, it was the second most-printed book after the Bible, which shows its significance for European cookbooks throughout the 18th century.